It's Sale-a-bration time! My favorite time of the Stampin' Up! year! It's Stampin' Up! 's biggest promotion of the year. Customers can earn a FREE Sale-a-bration product for every $50(before shipping and tax) you spend. Hostesses can earn a bonus $25 in FREE product from the catalog with a qualifying party of $250 or more. 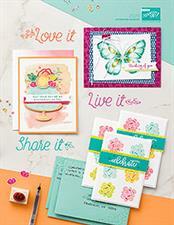 Sign up for the Stampin' Up! 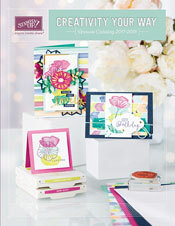 Starter kit during Sale-a-bration and get your choice of any Simply Created project kit from the Occasions catalog for FREE or get your choice of 2 FREE Sale-a-bration product of your choice included with your kit. The Starter kit is only $99 every day! You get to choose $125 worth of product in your kit and $50 worth of business supplies. It's a great deal! Sign up to get the 20 percent discount for yourself, sign up to sell products to your friends and family, or sign up to make money doing something you LOVE! Any way you choose you can't go wrong! Sign up through my website. Just click on Join the Fun and follow the easy steps. If you don't have the Sale-a-bration brochure and/or the Occasions catalog you can contact me at kathleen@myhappystampingplace.com to send you one or see the catalogs by the links on the side of my blog.